A Cornell Glen penalty kick, deep into stoppage time, salvaged a draw for North East Stars this evening as the Sangre Grande-based football club drew 2-2 with Police FC in the first game of a Digicel Pro League double header at the Marvin Lee Stadium in Macoya. A late double by Police captain Todd Ryan looked to have given the “Lawmen” their first League win against a team other than T&TEC FC. But, yet again, Glen rescued the Stars after referee Joel Davidson ruled that Police defender Jasimar Ashers fouled the 2006 World Cup attacker in the opposing penalty area. 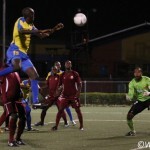 It was more woe for bottom placed T&TEC tonight as Antigua and Barbuda international striker Peter Byers notched a beaver trick for fifth placed Central FC as the “Couva Sharks” mauled the “Electricity Boys” 5-0. 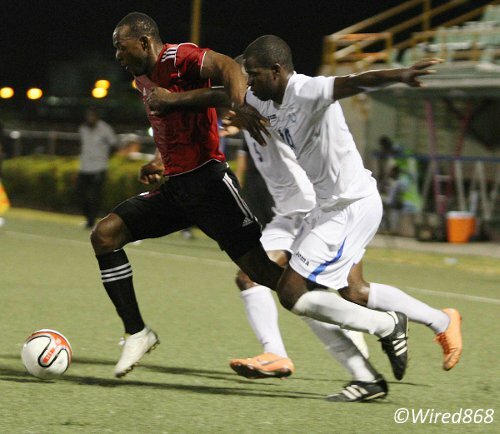 Photo: Central FC striker Peter Byers (left) leaves two Police FC players in his wake during a previous fixture. 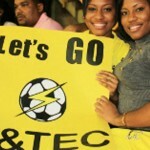 Only 14 from the 46 registered T&TEC players showed up at Macoya this evening for the match. The Pro League’s difficulties in drawing spectators is one thing but when even players stay away, it is surely time for action and it would be a surprise if T&TEC is invited back next season. Byers took full advantage of his opponent’s disenchantment as he tucked home a Jason Marcano through pass in the 40th minute and then scored three more close range items in the second half. 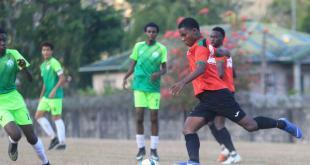 Veteran Central playmaker Marvin Oliver also chipped in with a penalty after a trip by Antuan John on Marcano. The opening fixture was nowhere near as one-sided. North East needed a win to reclaim third place from defending champions DIRECTV W Connection but, in the end, was lucky to get even the solitary point. Coach Angus Eve opted to rest star striker Cornell Glen, who was substituted with a knock during Stars’ 3-1 midweek win over Neal & Massy Caledonia AIA. But, not for the first time, his team laboured offensively without its talisman and only wayward finishing from Police kept the match goalless at halftime. Glen was introduced for the start of the second half and, 16 minutes later, the Sangre Grande team was ahead although he was not directly involved. 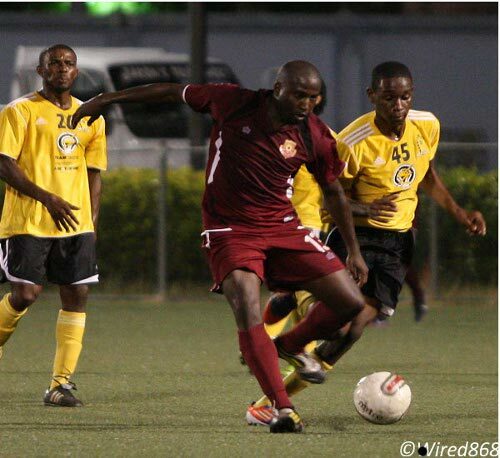 Photo: North East Stars striker Cornell Glen (centre) in action during a previous clash with T&TEC FC. 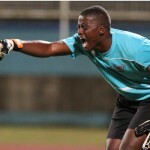 Police goalkeeper Keston Mata looked set to comfortably gather a low Elijah Manners cross when his defender, Karlon Murray, stuck his boot in and diverted the ball off the custodian and into the path of Marcus Gomez. The teenage winger made no mistake. But Police, led by its impressive midfield triangle of Kenaz Williams, Trent Noel and Ryan, refused to wilt. Ryan, who was in inspired form, almost managed a specular equaliser with a 22-yard blast towards the top corner in the 70th minute but Stars captain and custodian Cleon John was equal to the task with a fingertip save. John could not keep Ryan out from the penalty spot, though. Davidson ruled, rather harshly, that an attempted acrobatic clearance from Stars defender Elton John constituted reckless play. And Ryan’s penalty hit the upright and ricocheted off the goalkeeper before crossing the goal line in the 80th minute. The burly Police captain saved his best for last as, two minutes later, he collected a weak headed clearance from John (E) on the top of the box and brilliantly beat the Stars goalkeeper with a curling effort into the far corner. Police was still ahead after 90 minutes expired plus the four minutes allotted stoppage time. But, in the fifth minute of added time, Glen tumbled under a challenge from Ashers and Davidson again pointed to the penalty spot. And Glen dispatched the ball high to Mata’s right for his 15th Pro League goal this season, which tied Devorn Jorsling’s tally at the top of the scoring charts. Central FC (4-1-2-3): 1.Marvin Phillip (captain); 16.Carey Harris, 33.Weslie John, 3.Keion Goodridge, 19.Adrian Noel; 10.Marvin Oliver (15.Sayid Freitas 69); 32.Jason Marcano, 21.Darren Mitchell; 9.Anthony Wolfe (31.Rennie Britto 74), 7.Hayden Tinto (28.Hector Sam 79), 14.Peter Byers. Unused substitutes: 13.Shane Mattis, 18.Cyrano Glen, 27.Omar Charles, 37.Johan Peltier. T&TEC FC (4-2-3-1): 1.Akini Adams; 15.Tigana Sparks, 66.Antuan John, 7.Cebastian Bailey, 8.Eustace Darius; 20.Brent Garcia, 25.Givon John; 16.Bevon Bass (18.Husani Thomas 76), 46.Nathaniel Garcia, 19.Simeon Augustus (14.Keeron Benito 60); 10.Daniel Garcia (9.Sylvester Teesdale 60).